BOCA RATON – The Owls’ final road trip will be a long one. FAU won’t be directly flying home after its March 9 game at Marshall. The Owls will instead fly straight to Dallas for the Conference USA tournament, which starts on March 13. While FAU coach Dusty May echoed much of the same sentiment, he acknowledged that “everything changes” for his players on extended road trips, such as more independent studying and online work in lieu of the missed class time. There are positives, however, as May said the extra traveling gives his players more time to bond with the season nearing its end. That road trip will be Stapleton’s last as a collegiate athlete. He’s traveled a lot over the past four years – his freshman season at Louisiana Tech with May and the previous two at Mississippi State – and learned to love the opportunity it gives him to connect with teammates. And he’s taken full advantage of that opportunity since becoming an Owl. Before that season-ending road trip, the Owls will make a one-off stop at North Texas on Thursday. The Mean Green cratered after a blazing 20-4 start, dropping its last four games, including one to FAU on Valentine’s Day. The losing streak isn’t as lousy as it seems, however. North Texas played its last three games on the road and without some key players who’ve dealt with injuries. Guard Anthony Adger is struggling of late. The reserve-turned-star converted only four of his 24 shot attempts over the past two games, including 2-13 from deep. May said there’s “probably” some physical wear down on Adger, who’s shouldering the load of being FAU’s top scoring option, perimeter defender and distributor. But the Owls need him to persevere through the fatigue for them to make some noise in the C-USA tournament. 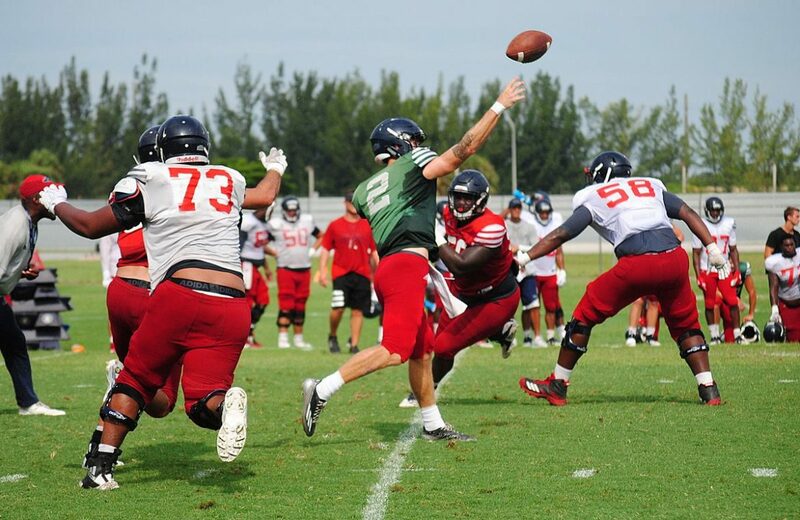 BOCA RATON –FAU simply can’t make up it’s mind when it comes to spring football practice. Hours after Conference USA announced, and the school confirmed, that spring practice would begin on March 12, the Owls changed their minds – and the date – to March 19. FAU had been trying to decide between April 13 and April 20 for the spring game. As of 6:50 p.m. on Tuesday the Owls are sticking with the originally announced date of April 13, but there’s no reason that date might not change, too. While FAU has yet to announce the full schedule, in past seasons FAU practiced on Tuesdays, Thursdays and Saturdays. The NCAA allows for 15 spring practices, giving schools five weeks from the first practice to complete spring camp. To fit all 15 practices between March 19 and April 13, the Owls would have to alter their previous schedule and practice four times in a week, or hold practices after the spring game. FAU is entering its third spring camp under Lane Kiffin. The Owls are coming off a disappointing 5-7 season. Five early signees in the Owls 2019 signing class, linebacker Diamante Howard, defensive back Dwight Toombs, wide receiver Adrian Bryant, tackle Lavante Epson and running back B.J. Emmons are already attending classes at FAU and will be eligible to participate in spring drills. Emmons, who began his career at Alabama when Kiffin was the Tide’s offensive coordinator, will have the early opportunity to replace Devin Singletary, who declared for the NFL draft following his junior season. Singletary, wide receiver Jovon Durante and linebacker Azeez Al-Shaair are the three former Owls who will take part in the NFL’s scouting combine over the next few days in Indianapolis. Running back Kerrith Whyte also elected to forego his final year of eligibility and declare for the draft. Tyrek Tisdale and Malcolm Davidson are expected to be Emmons’ primary competitors this spring. FAU also signed of slew of talented backs on National Signing Day earlier this month, but not of them will arrive before the summer. Spring practices could also mark the start of another FAU quarterback battle, with Indiana transfer Nick Tronti challenging incumbent Chris Robison for the lead role. 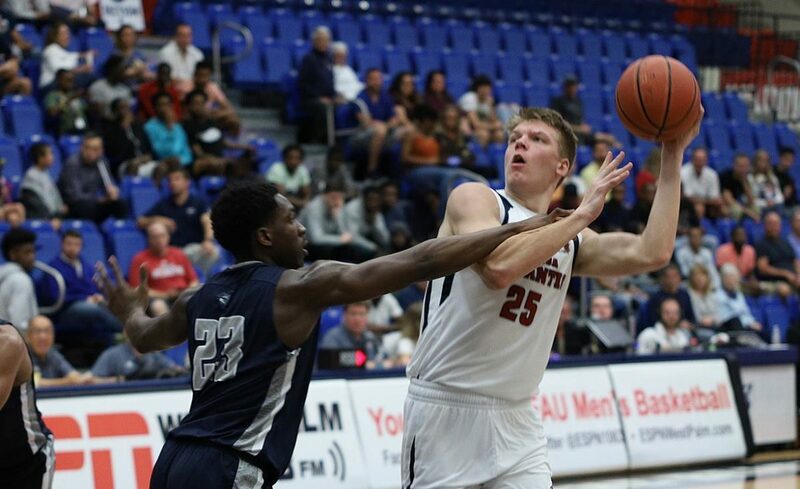 FAU brought junior college transfer Justin Agner into the fold in January as a walk on. Agner started for Kent St. against Penn St. as a true freshman in 2016 but never saw the field again for the Flashes after suffering a knee injury in that game. Kiffin led FAU to an 11-3 record and the Conference USA title in 2017, his first as an Owl. BOCA RATON – The third round of this year’s FAU-FIU rivalry ended in heart-breaking fashion for the Owls. FAU came back to take the lead in the second half after falling behind by double digits in the first, but was still defeated 79-76 by FIU in the opening game of Conference USA pod play. With 52 seconds left and his team up two, FIU guard Antonio Daye drove right and converted a high-arching layup over FAU’s Karlis Silins with the shot clock expiring, stretching the FIU lead to four. Daye’s bucket silenced the arena and FAU’s comeback bid. The absence of Xavian Stapleton late in the game was a big reason why FAU couldn’t maintain its lead. After arguing with an official, Stapleton received his second technical foul, causing his ejection with 4:14 remaining and his team up 63-61. FAU’s offense fell apart in his absence. Although the loss of Stapleton was a meaningful one, May disregarded it as being the sole reason his team fell. A stronger 40-minute effort could have prevented the Owls being in that situation in the first place. Moving Forward: Forward Madiaw Niang snagged a team-high 10 rebounds, in addition to scoring six points. …Richardson Maitre was a force defensively, notching two steals and six rebounds. …Karlis Silins scored 13 points on 4-7 shooting, including 4-4 from the charity stripe. Falling Backward: Anthony Adger missed 14 of his 17 shots, including 1-8 from deep. …After hitting his first two shots, Kevaughn Ellis missed his final six in a 2-8 shooting effort. …FAU shot a mere 25 percent from the field in the first half. Key Stat: 18 – Turnovers FAU committed, while managing only 12 assists. Up Next: FAU heads to Denton to battle North Texas, which owns the second best record (20-7) in C-USA. Tip-off on Thursday is slated for 8 p.m.
BOCA RATON – The improved play of FAU’s front court, particularly on the defensive end, has the Owls pushing for their first 20-win season since 2011. “Our rim protection has been much better and then our defensive rebounding been great just because of our size,” FAU coach Dusty May said. FAU begins Conference USA pod play on Saturday with a 4 p.m. tipoff against FIU. The Owls are guaranteed at least five more games this season. Win four of them and FAU reaches the 20-win plateau. Four weekends ago FAU split a weekend series with FIU, each team winning on the road. Since then the Owls turned up the defensive pressure. In three of their past four games the Owls held their opponent under 50 points. FAU hasn’t scored more than 75 points since dropping 89 in the victory over FIU. “We still want to run, we’re just playing bigger,” May said. The improved play of Karlis Silins, Aleksander Zecevic and Simeon Lepichev has May employing bigger lineups more often than he expected. As well as the Owls’ front court is playing, the play of FAU’s back court could be what determines Saturday’s outcome. FIU’s press frustrated FAU in the first meeting. The Owls’ started poorly and their late rally came up a little short. FAU controlled the Panther press much better two days later and won easily. A victory Saturday guarantees FAU it’s first winning season since joining Conference USA. 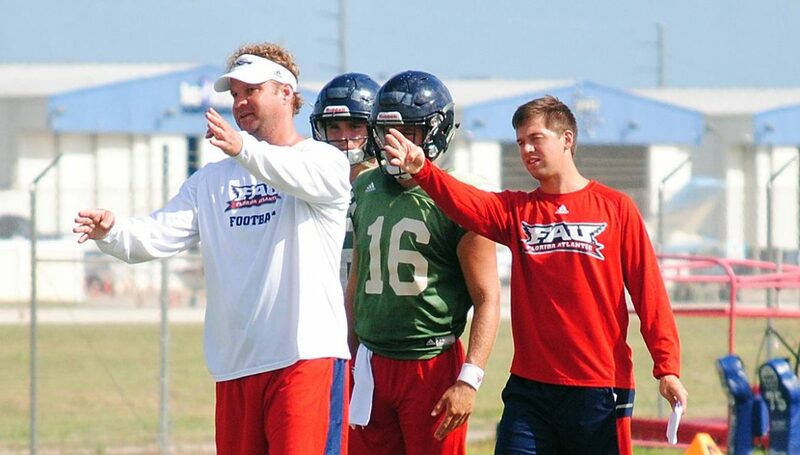 BOCA RATON – FAU football spring practices will include a quarterback who once started a game against Penn St.
Former Fort Scott C. C. signal caller Justin Agner is already enrolled at FAU as a walk-on, making him eligible for spring camp. The 2016 Penn St. game represented Agner’s lone start. Against the Nittany Lions Agner completed eight of his 15 passes for 64 yards, tossing two interceptions, in a 33-13 loss. Agner injured his leg in that game and never again saw the field for the Flashes. At Fort Scott last season Agner completed 24 of his 48 pass attempts for 222 yards, throwing two touchdowns against three interceptions, playing only the final three games of the season. If healthy Agner has a chance to compete for playing time. Considered more of a pro-style quarterback, Agner will add depth to the quarterback position but will have a tough task supplanting incumbent Chris Robison and Indiana transfer Nick Tronti on the depth chart. Robison threw for 2,540 yards and 12 touchdowns, completing 63 percent of his passes as a redshirt freshman last season. Rising redshirt freshman quarterback Cordel Littlejohn, a member of FAU’s 2018 signing class, will also be participating in his first spring camp as an Owl. De’Andre Johnson, last season’s backup to Robison, is in the process of transferring to Texas Southern. The Owls also lost reserve Rafe Peavey to graduation. Lane Kiffin and the Owls added Greenville (Ala.) quarterback Javion Posey as part of their 2019 signing class. He isn’t expected in Boca Raton until the summer. FAU has yet to announce a date for the start of spring football or for the Owls annual spring game. BOCA RATON – The state of Conference USA basketball in South Florida has been anything but sunshine. But that’s changed under the direction of two first-year coaches, FAU’s Dusty May and FIU’s Jeremy Ballard. Both teams are on an upswing after a long stretch where improvement seemed doubtful at best and impossible at worst. That’s why their C-USA pod play matchup on Saturday is more meaningful than the average rivalry game. Being competitive is the antithesis of FAU and FIU’s performance over the past half-decade. Neither of the two teams finished .500 or above since joining C-USA in 2013-14. And they haven’t been close, either, with FIU and FAU going 64-94 and 49-106 respectively. Identical records of 16-11 between the two of them this year with at least five games remaining means they both clinched that seldom-reached .500 mark. A victory on Saturday, however, would not only ensure the victor a winning season, but also a 2-1 head-to-head series lead in the rivalry. May hopes his team channels that extra motivation into a productive on-court play. FIU plays at a torrid pace offensively, scoring a C-USA leading 84.3 points a game. That high-speed mentality translates to the defensive end, where the Panthers constantly pressure opposing ball handlers with traps. Getting into a track meet with the Panthers would be an unwise proposition for FAU. 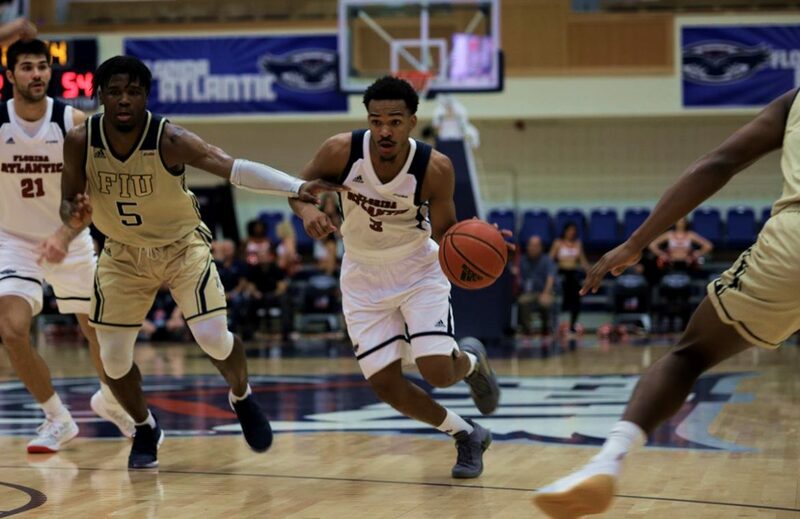 FIU forward Devon Andrews was unguardable in his two matchups against FAU, averaging 20 points on 58 percent shooting and 67 percent from deep. His size and ability to stretch the floor has burned FAU more than once. May hopes to prevent him from dominating a third time. BOCA RATON – Moments after his first collegiate game action Will Rutherford emerged from the FAU locker room still wearing his uniform. As he rounded the corner to hug his family, a group of youth basketball players swarmed the 6-foot-4 Rutherford in search of autographs. Rutherford signed shirts, balls and the game day program, which features individual profile photos of the Owls on the back. One youngster, after receiving the autograph, studied the photos momentarily before asking, Which one is you? “My picture’s not on here,” Rutherford said, grinning. He didn’t explain why. The story would have taken too long. Rutherford was never supposed to play Division I college basketball. He wasn’t on the FAU roster when the season began, and wasn’t even trying to make the team. Until a couple week’s ago, Rutherford’s biggest contribution – if it can be called that – to the FAU basketball team came when his grandfather helped FAU coach Dusty May get his first job in college basketball. As a youngster May did landscaping work for Dave Rutherford. When May decided he wanted to pursue college basketball coaching as a career, Dave made call to his friend Larry Rink, at the time Indiana University basketball’s team doctor. In the late 90s May served as one of Bobby Knight’s team managers. Fast forward a couple decades. 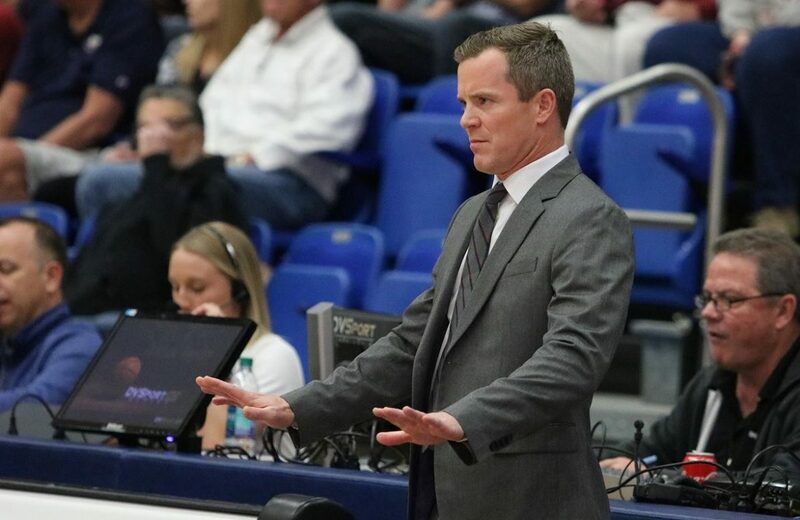 May, now at FAU, earned his first head coaching job. Much like May a generation prior, Will wanted to try a career in basketball coaching. Will hadn’t exactly taken the tradition route to NCAA basketball. Born in Fairfax, Va., Rutherford graduated from the International School of Bangkok in Thailand, where his family still lives. He attended the University of British Columbia in Canada for one year before reaching out to May. Rutherford enrolled at FAU in 2018 as a business management major and joined the Owls’ basketball team as a manager. With injuries crippling FAU’s depth in late January, May came to a realization. May’s decision wasn’t charity. He’d watched Rutherford play on the scout team during practices, seeing an intelligent player who could help on the boards, if necessary. Rutherford’s first game in uniform came in FAU’s Jan. 31 victory over La. Tech. After the closing seconds ticked away, Rutherford started cleaning up the bench area, a reflex action for team managers, before an assistant told him to head out to the floor and join his teammates in celebration. Ever since then Rutherford is pulling double duty. He’s a manager much of the week. On game days, he’s an athlete. “Every once in a while I’ll look back at my buddy Jake (Simmons), one of my fellow managers, and I’ll joke that I need a towel, or for him to bring me some water, just to mess with him a little bit,” Rutherford said, laughing. Which brings Rutherford to Saturday. With FAU leading Rice 60-41, May called timeout with 15 seconds remaining in the game for the sole purpose of inserting Rutherford, the lone Owl without a last name on the back of his jersey, into the lineup. FAU’s bench erupted in cheers as Rutherford took the court. Seeing the players’ reaction, FAU fans followed suit. With his mother, Elizabeth Rossini, having made the trip from Thailand to see her son in uniform and his father, Mike, watching a 2 a.m. live stream of the game from Bangkok, Rutherford flawlessly in-bounded the ball to Richardson Maitre, and the Owls dribbled out the remaining time. Rutherford’s name will forever appear in agate type. It’s on the record. He played Division I college basketball. 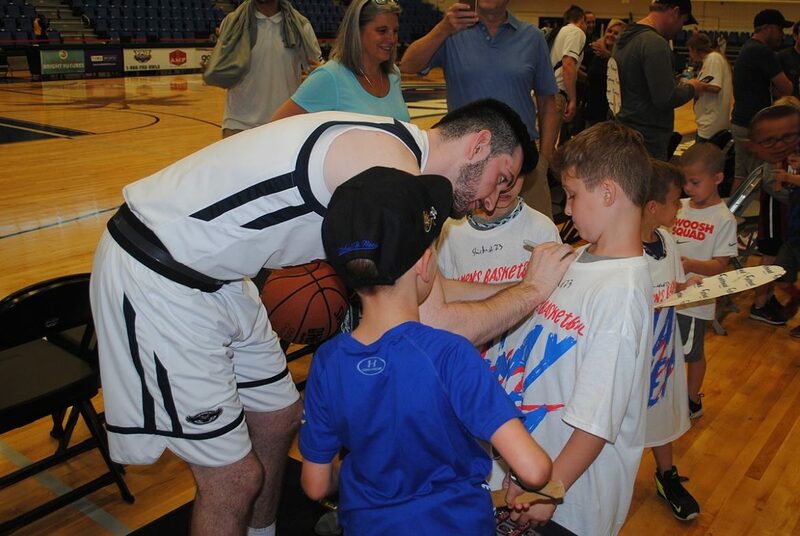 That appearance led to Rutherford’s first autograph session as an Owl. “First autographs since probably middle school when I was able to dribble through my legs and they thought I was going to the NBA,” Rutherford said. Now that Rutherford’s a college athlete those original autographs could suddenly grow more valuable. After all, NCAA basketball is the gateway to the NBA. “Hey, one step away,” said Rutherford, still smiling. BOCA RATON – Dusty May is excited about the teams FAU will face when Conference USA enters pod play for the first time next week. The travel involved for some of those games? He could do without that. 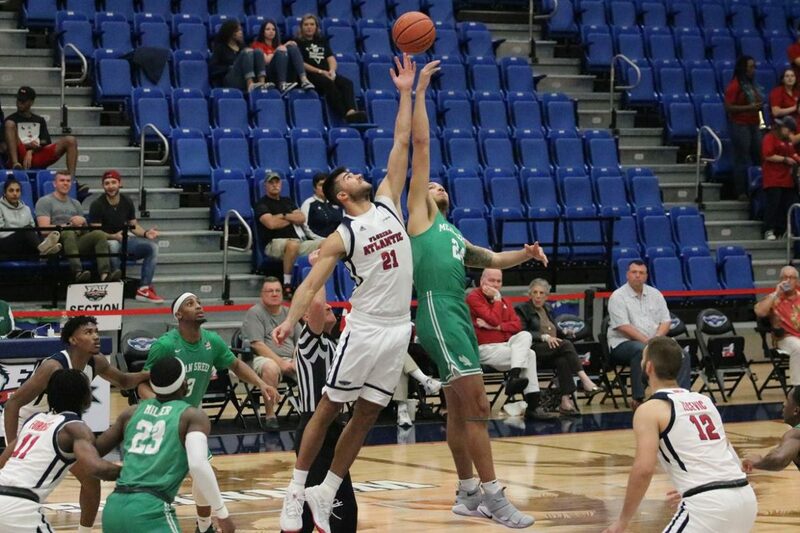 FAU welcomes FIU and Louisiana Tech to The Burrow in coming weeks, but travels to North Texas on Feb. 28 and concludes the season on March 9 in Huntington, W. Va. – a town notoriously tough on travel – against Marshall. FAU will then have to head back to Dallas for the C-USA tournament. Conference USA initiated pod play this season in an effort to give the teams at the top of the standings after 14 games the opportunity to improve their NCAA Tournament at-large resumes. Teams sitting in spots 1-5 in the standings after Saturday’s action all play each other in the first pod. The second pod, FAU’s group, consists of teams 6-10. The final four C-USA teams are in pod three. During the first portion of conference play each team played every other team at least once and played one team – their geographical rival – twice. That rival for FAU was FIU, and the two teams meet for a third time this season on Saturday. The Owls and Panthers split the first two meetings, with the road team winning both games. FAU defeated La. Tech 69-61 on Jan. 31 in Boca Raton. The Bulldogs will have a chance to avenge that loss when they make their second trip of the season to South Florida for a March 6 game. May previously served as an assistant at La. Tech, and FAU forward Xavian Stapleton began his college career as a Bulldog. Marshall, last year’s Conference USA Tournament champion. is the only team in the pod that FAU didn’t beat during the regular season. By being in the second pod, FAU has secured a berth in the 12-team C-USA tournament. If FAU sweeps pod play they would be the No. 6 seed in the tournament. The Owls will be seeded no lower than 10th. May still isn’t prepared to render a judgment on whether he likes the new pod play. 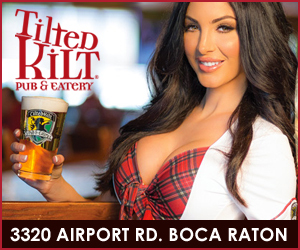 BOCA RATON – There was room for only set of Owls in the Burrow. A dominating defensive performance from FAU ensured it was theirs, propelling Florida Atlantic to a 60-41 victory that clinched a C-USA tournament berth. FAU (16-11, 7-7 Conference USA) took down Rice in convincing fashion, 60-41, ensuring a spot in the second tier of Conference USA’s pod play. In what ultimately became a must win week, Florida Atlantic scored less than 120 points combined in their two games, winning both by more than double digits. Rice (10-17, 5-9 C-USA) had no breathing room offensively. FAU held Rice to 26.7 percent shooting, including a frigid 20.8 percent from deep. Rice couldn’t get easy looks in transition. It never found a consistent rhythm from deep; and the driving lanes stayed shut all game, too. The tone of the game was set by FAU’s front court – Simeon Lepichev, Karlis Silins and Alexander Zecevic – who, in addition to holding their ground down low defensively, contributed a combined 24 points on 63 percent shooting. May said the success his frontcourt came as a result of the grunt work from his guards. “They’re good scorers one-on-one, and I thought our guards did a great job of finding them, and sacrificing their shots and their numbers to get it inside because that’s what was working,” May said. Moving Forward: FAU held Rice to 12 first-half points and limited an opponent to less than 50 points for the third time in four games. …Taking the role of floor general, guard Richardson Maitre dished out five assists, which tied with Anthony Adger for the team lead. He added six rebounds, a steal and two points. … Swingman Xavian Stapleton hit seven of his nine free throws, finishing with a team-leading 14 points. 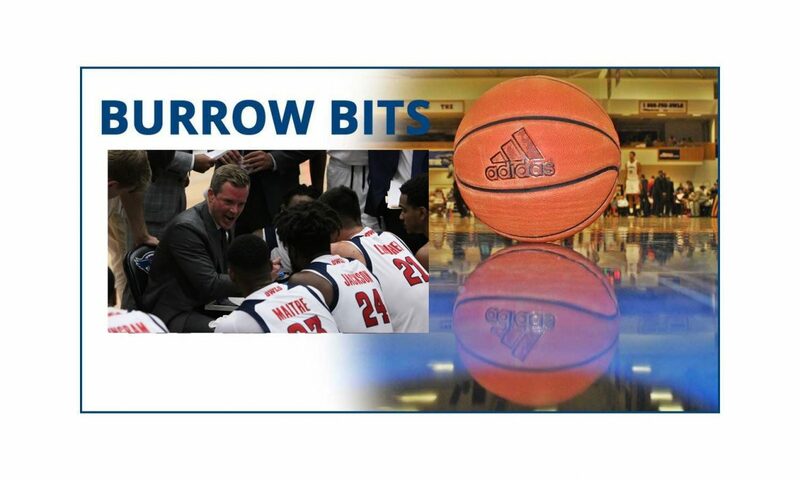 … The win marked FAU’s ninth at home, which is triple the amount of losses (3) it’s suffered in The Burrow this season. Falling Backward: Adger missed all but one of his seven shot attempts, including 1-5 from deep. … Only five of FAU’s 21 three-pointers sank. … FAU committed 12 turnovers, compared to only 13 assists. Key Stat: 1 – Point Rice had minus its turnover total (11) in the first half. Up Next: On Sunday Conference USA will announce FAU’s next opponent. 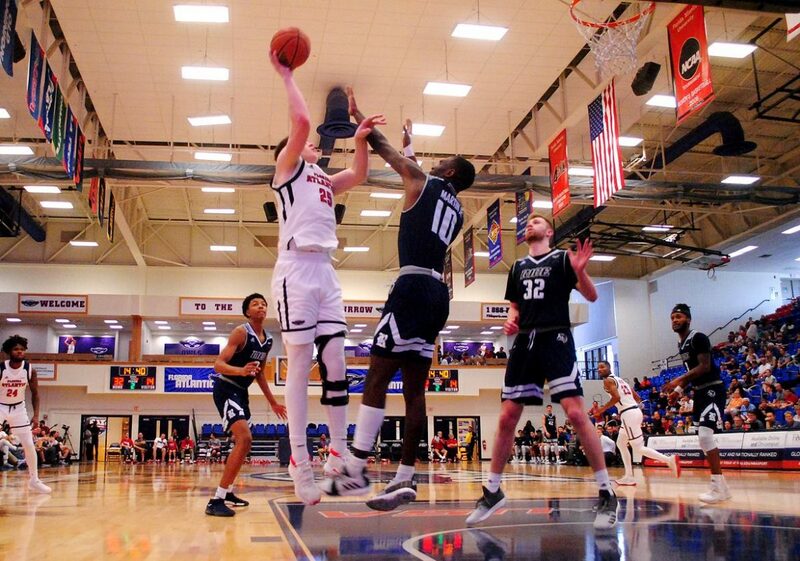 BOCA RATON – The pending reward for Florida Atlantic should it beat Rice on Saturday is relatively straight forward: A win guarantees a spot in the Conference USA Tournament. A loss doesn’t eliminate FAU, but it could complicate matters. A victory for FAU will ensure it is seeded in the second pod when C-USA releases the schedule and opponent for each conference team’s final four games following Saturday’s contests. If FAU clinches a spot in the second pod (teams holding spots numbered six through 10 in the standings following Saturday’s games), it will be assured of being seeded no lower than 10h in the 12-team C-USA tournament. With a victory over Rice FAU could be seeded as high as No. 7. Should FAU lose on Saturday, it will immediately begin scoreboard watching. A loss by La. Tech at home against UTSA or a loss by FIU against North Texas also ensures that FAU will be in the second pod, thereby making the tournament. Once locked into a pod, teams can not achieve a Conference USA Tournament seed higher that the highest seed in that pod or fall lower than the lowest seed. After seeing its teams consistently fail to receive at-large bids to the NCAA tournament in recent years, Conference USA adopted the pod system schedule as a means to help teams at the upper level of the conference play games that will raise their NET (formerly RPI) rating, increasing the chances the NCAA will find their resumes attractive. That’s unlikely to matter much this season. Conference USA leader Old Dominion (20-6, 10-3) currently holds a NET ranking of 86, about 46 points too low for at-large consideration. A loss to FAU (15-11, 155 NET) earlier in the season, is one of the black marks on the Monarchs’ record. Even if FAU loses to Rice and falls to the third pod, Florida Atlantic will still be favored to play its way into the Conference USA Tournament. FAU will be the top seed in pod three and will be no worse than two games ahead of current cellar dwellers UTEP and Charlotte with only four games remaining in the regular season. The Top 2 finishers from pod three round out the C-USA tournament field. FAU enters Saturday’s game in a four-way tie for seventh in the current C-USA standings with a 6-7 record, one game better than Rice. Florida Atlantic has yet to sweep both games during a single weekend of C-USA play. FAU defeated North Texas 57-47 on Thursday night.